you are Luka, a twelve-year-old boy who has to save the life of the storyteller father you adore. you have two loyal companions by your side: a bear called Dog who can sing and dog called Bear who can dance. 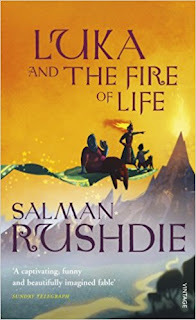 Luka and the Fire of Life is effectively a sequel to the Haroun and the Sea of Stories written by Sir Salman Rushdie. This is also a novel targeted at younger readers and is dedicated to his younger son Milan, whose middle name is Luka. Thus, it can be seen that this follows a model very similar to that of the author’s earlier aforementioned book. Similar to that, there is a young boy Luka who enjoys his father, Rashid’s stories. However, on a fine day, Rashid is struck by a coma and has his life threatened by a genie named Nobodaddy. 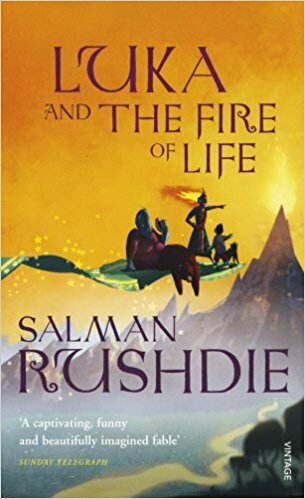 To bring Rashid back to life, Luka must bring The Fire of Life from the world created by his own father through his stories. Nobodaddy, his two pets – a dog named Bear and a bear named Dog would be companions in Luka’s journey. Unlike the author’s previous book with a similar theme, this time it was made a lot more personal, wherein, here Rashid could possibly die whereas the last time around, he was just unable to tell stories. It started very well, when it went inside Rashid’s world – filled with witty riddles to cross various paths, interesting enemies on the way – elephants, a group of abusing otters, etc. However, midway through the book, I felt the author lost the plot, he tried to make it into some kind of a game wherein Luka had to save his ‘progress’ in the mission. His writing was not as simple for a younger reader to understand nor were some of the themes within and at the same time, the plot was not too interesting to keep other readers engaged. The rules of the adventure were highly malleable and were constantly changing as and when Luka goes into a dire situation. While I certainly liked the way in which he described the setting, there was nothing else that was noteworthy about the novel. My expectations on the author are always quite high and while I understand that this was targeted at younger readers, I used a similar book as yardstick to set my expectations (Haroun and the Sea of Stories) and as compared to that, this book is a terrible disappointment. On that note, I would award this book a rating of four on ten.